The Linn County Courthouse, where the Millersburg utility controversy has landed. When Millersburg voters decide whether to authorize their city of 1,500 to borrow $40 million, chances are they’ll face a question more pointed than the one the city council approved on July 14. The election will be crucial in the council’s attempt to form a city electric company to replace Pacific Power. The council could form the utility on its own, but under a charter amendment initiated by opponents, voter approval is required if the city wants to borrow more than $250,000. For the power project, the council wants to borrow up to $40 million. 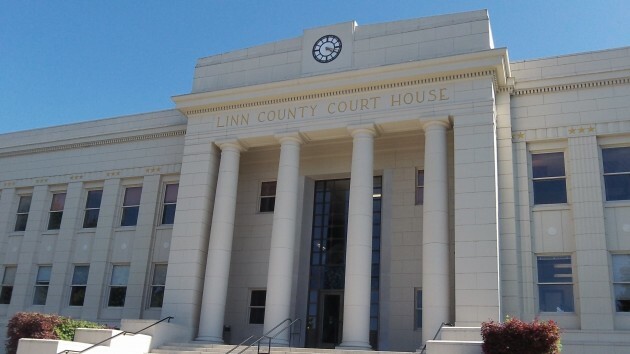 The question approved by the council says: “Should the City obtain financing to form a municipal utility to provide electric service to customers within the city?” On Thursday, lawyers for the opponents, Millersburg Residents for Responsible Government, went to Linn County Circuit Court to challenge that and the rest of the ballot title. Judge Thomas A. McHill has the case, but as of Friday he had not scheduled a hearing. The challenge was filed by John A. DiLorenzo and Gregory A. Chaimov, two prominent lawyers with David Wright Tremaine of Portland, and Andrew S. Noonan of Corvallis. They asked the judge to rewrite the title, and as a ballot question they proposed: “Should City borrow $40 million to construct new assets and condemn existing utility assets for proposed municipal electric utility?” That puts the $40 million right at the top where voters can hardly miss it. The council’s version didn’t mention the $40 million until the next-to-last sentence in the ballot summary. The disputed Millersburg ballot title has not yet been filed with the Linn County Clerk, elections supervisor Derrick Sterling said Friday. That will have to be done for the voting is to take place, most likely in the general election Nov. 3. The push to form the city utility has been funded largely by ATI Millersburg Operations, the town’s biggest electric consumer formerly known as Wah Chang, on the grounds that customers would save money once Millersburg gets access in three years to low-cost federal power from BPA. Pacific Power has vowed to fight having its system taken over, and the utility has supported the citizens’ committee. The latest campaign finance report shows that as of April 14, Pacific had made $44,529 in in-kind contributions for things like advertising, printing, and management services.